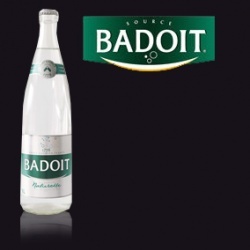 Badoit water is found in a valley of the Loire, in the heart of the French countryside, near the town of St Etienne, in Saint Galmier…. a very small town known for its famous Spa which features this water on its menu. It was named after Auguste Badoit. The water is naturally sparkling and comes bubbling up from a deep rock spring on the edge of Monte du Lyonais pushing its way up from over 500 meters down. One of the special features about this water is that the rooms where it is bottled are maintained at the same pressure as the way the water flows in its natural state in the spring itself. This is a gourmet’s mineral water seen on the tables of most restaurants in France as an accompaniment to good food and wine.